WASHINGTON (CNN) -- The White House did not intend to show any disrespect toward Nancy Reagan when it failed to invite the former first lady -- a vigorous supporter of stem-cell research -- to a bill-signing ceremony on the subject, White House Press Secretary Robert Gibbs said Tuesday. 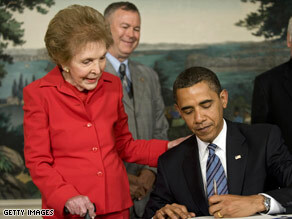 Nancy Reagan watches President Obama sign the Ronald Reagan Centennial Commission Act Tuesday. "I think she speaks in real personal terms about the issue," Gibbs told reporters. "And I think her candor and her courage have been heartening, and we certainly meant no slight to her whatsoever." On Monday, Vanity Fair published an interview with Nancy Reagan on its Web site in which she suggested the Obama administration missed an opportunity by not inviting her to witness President Obama signing a measure in March expanding federal support for stem-cell research. The former first lady has long promoted such steps despite objections from many in the GOP. She has argued that expanded stem-cell research could have helped her husband, who suffered from Alzheimer's disease. "Politically, it would have been a good thing for (Obama) to do. Oh well, nobody's perfect. He called and thanked me for working on it. But he could have gotten more mileage out of it," she said. Gibbs' comments also come the same day Mrs. Reagan attended a White House ceremony marking Obama's signing of legislation authorizing a Ronald Reagan Centennial Commission. Mrs. Reagan is slated to attend the unveiling of a new statue of President Reagan on Wednesday morning at the Capitol and then share a private White House lunch with first lady Michelle Obama. Obama issued an apology to Mrs. Reagan earlier this year after joking in a news conference that she held seances during her years in the White House -- an apparent reference to reports she consulted with astrologists during her husband's presidency.